A recent work-related meeting brought me to Boston, but alas I was stuck pretty much next to the Prudential most of the time where I can either spend $100 on lunch or eat mall food. Luckily, there is a Summer Shack right across the street. 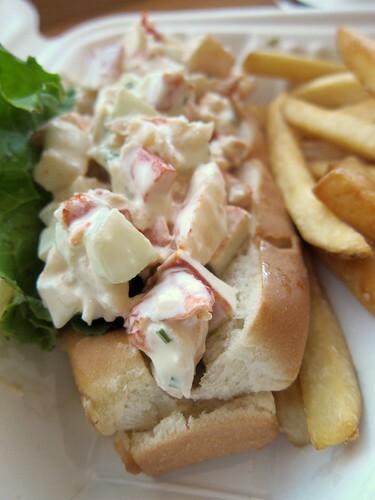 It's time for Ipswich clam bellies and lobster roll! Food still isn't cheap here, but since I'm in Boston I might as well try them. The dinner portion for the Ipswich belly clams come with fries and cole slaw and runs for $23. 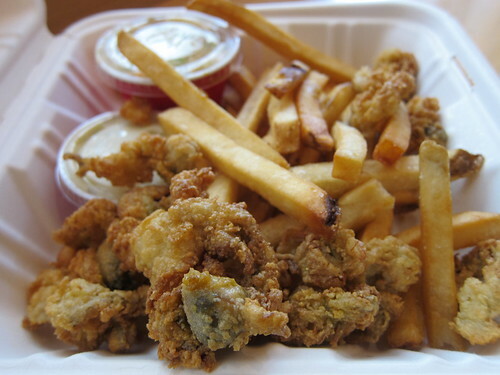 The difference between this style of fried clams is that the whole belly, i.e. the whole gastrointestinal tract, of the clam is left intact. This gave a deeper, much earthier flavor to these fried clams. Since I've never had them before I can't tell you how good these are compared to other Ipswich belly clams in Boston, but it is clear that for Bostonians, having fried clams without the belly on will not even be close to the real thing. The Summer Shack Lobster Roll is made from meat of a 1lb lobster and costs $20. The bun was the weakest point in this roll but the chunky fresh lobster meat was pretty satisfying. Having tried some lobster rolls in LA with LAist's Sam Kim for his "Roll Call" I'd like to claim I know a little bit more about them than I do about belly clams. Here the mayo wasn't too thick and I enjoyed the chunks of cucumbers in the roll as well, but with that bun I can only consider them comparable to LA's lobster rolls. Thanks for the tip! Maybe I'll check this place out in a few weeks. that lobster roll looks so effin' delicious! I miss New England lobster! You might be comparing them to LA's lobster rolls, but that's because LA's copies Boston's - the bun in the picture is legit - a squared off, split-top hot dog bun is essential for an authentic lobster roll.